A steward in government is responsible for the day-to-day running of one of the nine holds of Skyrim. Most stewards are loyal to either a single jarl or the jarl's family, rather than a faction, and will stay with them wherever they go. 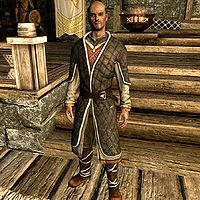 In court politics, stewards are second only to the jarl, being more important than both housecarls and court wizards, due to their supposed political knowledge. In times of crisis, jarls will turn first to their steward for advice on how an action they take will be viewed by the other jarls. The game begins with a steward in each of eight holds in Skyrim—the jarls of the Pale do not employ stewards. Some are affiliated with either the Imperial Legion or the Stormcloak Rebellion, while three others will serve either allegiance. When a jarl is replaced after you help a side in the Civil War to capture a city they do not control, or through the negotiations made during Season Unending, some of the newly-instated jarls will seek to employ a new steward of their own, while two will be retained by the new jarl. If the Battle for Solitude is won, Solitude's entire court will merely change allegiance. Falk Firebeard will simply continue his role, as the government of that hold is not replaced. Deposed Imperial governments will seek refuge in the basement of the Blue Palace in Solitude, while deposed Stormcloak governments will go into exile in the Palace of the Kings in Windhelm. Only the jarl (and possibly their family), their housecarl, and their steward will be evicted from the building, and they will be unfriendly towards you. As part of their job, they will hand out rewards for most bounties given for their hold, even if they were not the one to give the bounty to you. Though the jarl is responsible for deciding if someone is allowed to buy a house in their city, it is left to the steward to sell the house and the furnishings. The Pale Dawnstar Jarls of the Pale do not employ stewards. †Captain Lonely-Gale is intended to serve as Jarl Brunwulf Free-Winter's steward, but doesn't due to this role not being set up correctly. Jorleif does however maintain the same resentment towards you as other deposed stewards following the Battle for Windhelm. This issue has been fixed by version 1.3.2 of the Unofficial Skyrim Patch. ‡If Hearthfire is not installed, Jarl Sorli the Builder is her own steward due to an oversight. ††Proventus Avenicci will return from exile if Brill dies. With the Hearthfire add-on, certain followers can be hired to become a personal steward upon purchase and construction of a new house. As the Jarls of the Pale do not have stewards at their court, when you receive a bounty letter in that hold, they will be left signed "---" due to the absence of a steward. This page was last modified on 8 July 2018, at 18:51.